In early September I realised that I had 2 weeks off in November, yet nowhere to go. I love doing my weeks up north but didn't want to do 2 of them in a row, especially when I had just done one in mid-October. So I looked abroad and at the Champions League game. Most of the options were unavailable, or very expensive. In hindsight, I wish I'd paid €120 for the Ajax v Celtic game or €60/€80 for the Paris St Germain v Anderlecht game but those options went very quickly while I was doing my research. So I decided to turn to a company called Football Breaks and get a package off of them. At least it would all be organised and reduce the hassle factor of trying to find a ticket, which was not guaranteed at the time. After I had looked at all the options I chose Atletico Madrid v Rapid Vienna. It was by far the cheapest option with a headline price of £179 and had some great options for trying some new Spanish ciders. However, once I had added an extra night, got better flights and paid the dreaded 'single room supplement' it was up at £340. Fairly expensive for a couple of nights, but I wanted something set in stone. Once I had added £30 for the petrol and £20 for the insurance (due to a pre-existing medical condition) the costs were going up considerably. I reckon around £500 all in once food etc is taken into account. 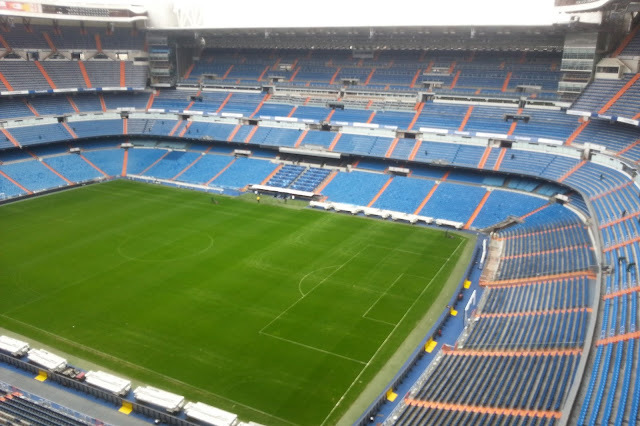 But I looked on the bright side, I would be able to visit Real Madrid's stadium for a tour, and my parents had subsidised most of my holidays in the past, so I wasn't as miffed at spending this much as I could have been. I decided to charge my 'football expenses' £150 for this, which was going to mean that I was very unlikely to meet my budget that I had set this season to stick to. But I had aimed low, and visiting football grounds and seeing new places was something I really enjoyed. As it turned out when looking at the club website the day before the game, I could have got tickets for €30, which was annoying but I put it to the back of my mind and decided to enjoy the trip away. I'd spent the previous night watching Slough Town v Wycombe Wanderers in the Berks and Bucks Cup, the game being played at Beaconsfield SYCOB. It was my 4th visit to this ground. After a poor first half showing from Wycombe, they improved in the second and ended up winning 3-0, the highlight a decent 30-yard strike from Matt Spring being the highlight. It wasn't the greatest of games however and I was left wishing I'd taken up Anwar's offer of going on a groundhop to Chasetown. Maybe it was the pretty poor view from the terrace that I got of the action that made it seem worse. I only stood there to be with mates, normally at a ground like this, I will stand on the halfway line. I usually stand on the terrace at Wycombe but for the upcoming FA Cup game, I am going to sit in the upper tier as it's only £2 extra. On the morning of my flight, I woke at 4, leaving home at 4.30. It was a nice easy trip and I was at the airport parking place by 5.45. It was nice not to have the hassle of checking a bag in and so after going through airport security I got myself a Sushi salad for breakfast along with a drink. I watched some YouTube videos on my iPad before it was time to go to the boarding gate. I noticed there were a fair few Arsenal fans at the airport, heading out for their Champions League game in Dortmund. The plane left on time and with no hassle. There were none of the horror stories you hear about with RyanAir. If you are sensible, you won't get extra charges, and the legroom was the same as I have had on any other flight. The plane was a bit brighter and more modern than other I have been on recently and they did a large range of food with prices in line with other airlines. The flight arrived on time and after I had worked out where I was going I bought myself a 3-day travel pass for €18 and a ticket for the Real Madrid stadium tour for a couple of Euros less than paying on the day. I'd pre-planned instructions on google maps beforehand and these were simple to understand and once I got to the stop near my hotel it was easy to find using the map that I had. I arrived at my hotel just before 2pm. 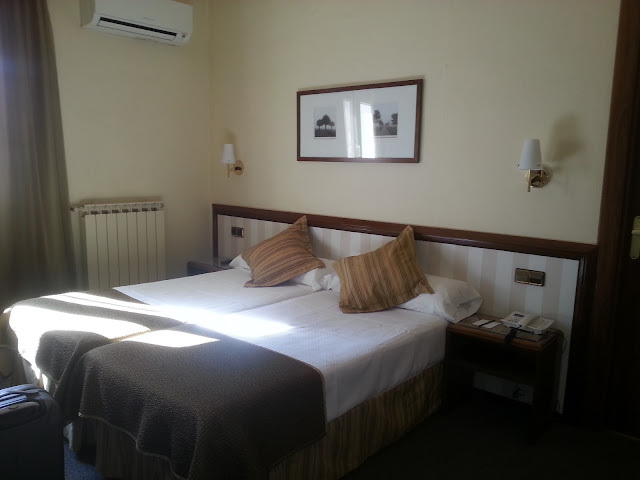 After checking in, I went and relaxed in my room for a couple of hours and had a shower to freshen up before heading out. First, off I went down the supermarket to get a bottle of pop for to keep in the room, as well as some fruit and bread as breakfast was not included in the price of my room. 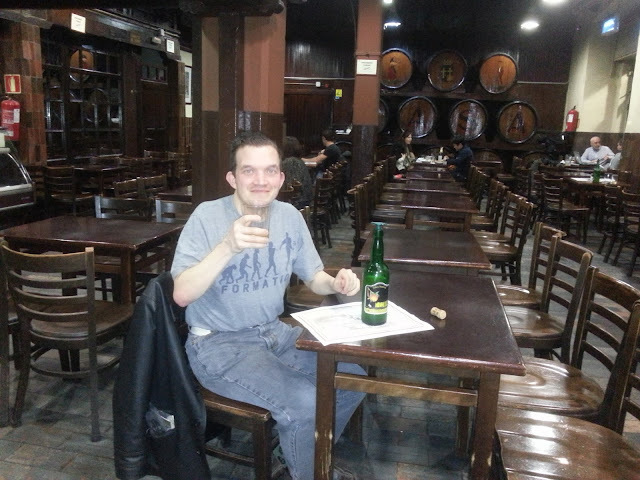 There was also a nice little bonus in the form of a good range of Spanish Cider, about 15 different ones in all. And they were all very nicely priced too, meaning I could save money on drinking out. I was still planning on going to the special cider bar though, just not as much as I previously thought. So I came back to the room for another couple of hours and watched YouTube videos on my iPad and a bit of footy on TV. Or at least I would have watched YouTube if the connection wasn't so gash. I headed out around 6. The ground was a lot further than I thought, taking 40 minutes. I stopped at a shop to get some drinks for the game. When I got there I took some pictures of the outside of the ground before going to pick up my ticket. I then bought a very nice match scarf for €10 before going in the ground. The seating system was a bit confusing with all the seats being in blocks and no row or seat number going over 30, so you had to be careful you got the right block. In any case, it was a great seat, bang on halfway and high up. Suddenly paying a bit more didn't seem to matter. The game was pretty decent too, albeit a bit one-sided with Madrid winning 4-0. Maybe if Vienna had taken one of their earlier chances it might have been a different story. Atletico could even afford to miss a penalty, saved well by the Vienna keeper. Credit to the visiting fans, they never gave up cheering and stayed behind to applaud their team off the pitch. I got back to my hotel about 11.40 and had a couple more bottles of cider while watching the Champions League highlights before going to bed just before 1. I had a good nights sleep, waking up at 10am. I had a shower and some breakfast and was out by 11. The train to the Bernebau was pretty simple, just one stop and a 10-minute walk. I was there before 11. Thanks to my ticket I bought yesterday I just went straight in without the hassle of going to the ticket office. I have to say it was a brilliant tour and a fantastic stadium. There was plenty to look at. Some of the trophies were great, especially the Celta Vigo trophy they won in the 1980s. It was as big as I was, which isn't that massive in human terms but it's positively gargantuan when it comes to trophies. I got to see the VIP area, the dressing rooms, the press area and all around the stadium. I even got my picture taken with Gareth Bale via clever photoshopping techniques. I was thinking of buying one and passing it off as real but at €12 just for a standard size photo, I gave it a miss. The high prices summed up the shop - €23 for a scarf. Maybe if I had seen a game there I might have indulged but not just for a visit. I then tried to get the train to see Getafe's ground but it was only ŵhen I got to the station and tried to get out that I realised my travel card didn't cover it. So I just got back on the train and went back to my hotel. A bit later I went out and got a replacement USB lead for my phone as the other one had become damaged. I also went to the supermarket and stocked up. I had been in Madrid for over 24 hours and still not been to a restaurant. It had saved me money but I was going to treat myself in the evening to a proper meal. I had tried 6 different ciders while in Spain and would have tried more but some of them needed a corkscrew to open them which I didn't have. I had noticed earlier that the streets of Madrid were filthy and overflowing with rubbish. This was due to a strike by the street cleaners. It was like Brussels in that respect, both great cities but very dirty. They were both excellent for drinking and football though, so I was won over. I went out for dinner just before 7pm and headed to the cider place that I had done some research on. It was just over 2km away but I didn't mind as I quite like walking. It was called Casa Mingo and had got good reviews on Trip Advisor. It was certainly excellent on the cider front, firstly I had a pint of the draught cider, then went onto 2 bottles. Firstly a bottle of the house cider, then onto a dry cider where the way to have it at it's best was to pour it on a great height and only have a little bit in your glass at the time. All were very good and I'd say the food was pretty decent, if unspectacular. Firstly I had a whole chicken, then a Spanish sausage. It came very quickly, within a couple of minutes as is the case with most tapas food. It was a tad more expensive than other places that I had seen but still pretty reasonable, the equivalent of 4 pints of cider and the meal set me back €30 once I had paid a tip. I was happy enough spending this, it was something special that I had not experienced before, and am unlikely to get the chance to do so in the future. I got back to the hotel and watched Vitoria v Real Betis on the TV before falling asleep at halftime. I got a good nights sleep after a nice final evening on my city break. Friday was a bit dull, I stayed in my room as long as I could, till the checkout time of 12pm. With it being less than an hour to the airport and my plane not departing till 5.15pm I went out and looked for somewhere to have lunch. 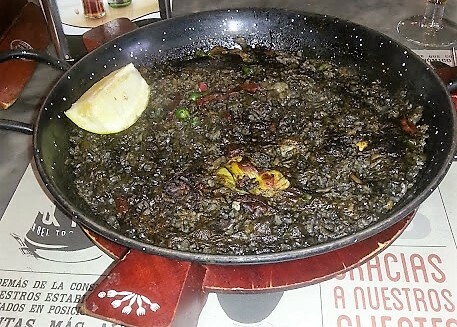 I had a real hankering to have Paella whilst I was in Spain and so searched for places that did it. The first one I saw got stinking reviews on Trip Advisor, so I gave that a wide berth. Then the second would only do it for 2 people or more. Third time lucky I found a place called Cafe & Te. I opted for the black rice Paella which got it's colour from squid ink and it turned out to be delicious, and I had a nice glass of fresh orange juice to go with it. I then made my way to the airport, getting there with just under 3 hours to go till my flight left. Going through security killed some time, but as with most foreign airports, there isn't much to do. At least in British ones you get a Wetherspoons and a few reasonably interesting shops to kill the time. Eventually, it was time to board, and unlike the outbound flight which only had about 20 people on it, this one was pretty much filled to capacity. The flight went fairly quickly and I read a large chunk of the book that I had bought at Poundland, My Word by Terry Christian, a very decent read so far. There's a lot of moaning about Ryan Air but I enjoyed my experience and will have no hesitation in using them again. I had been hoping to see a game at Newmarket when I got back, but Stansted dawdled so much on passport checks that that idea was dead in the water. I know it's down to terrorists, but it took around 45 minutes to clear a fairly short queue. Al Quaeda has a lot to answer for, it's their fault I couldn't bring any cider home, or save money by buying soft drinks before I got to the airport. A service that was a lot quicker was my Jetparks bus to my parking space. The bus was there and waiting when I got out of the airport and left within 60 seconds of me getting on. I was back at my car at 7.25, and save for 10 minutes delay on the M25 due to a lane closure, as well as the perverted average speed camera limit through some roadworks, the journey home was fine, with me getting in at 8.50. I had listened to the Lancashire Hotpots on the way home which had kept my mood good, their upbeat songs matching my mood. It had been a good trip to a great city, and I had enjoyed going abroad for football. The only bad thing I found out about Madrid was the very slow internet on my phone. It was like going back to 1999 on a dial-up connection, leaving me unable to watch a video or share pictures. As for the company I travelled with, Football Breaks - the package was very good, but it was a tad expensive if you are a single traveller. If you go with someone, the prices are not so bad. Customer service is good though and they kept me informed and made the whole experience easy. Next on my list for foreign visits I am hoping for Amsterdam, Frankfurt or the Faroe Islands, hopefully with better planning, aided by my previous experiences. VICENTE CALDERON STADIUM is one of the older stadiums in Spain and is looking a bit long in the tooth in places. The club plans to move in the next few years, but it's worth the journey to see it before it gets knocked down. As with all big grounds, it is all seated. It's only covered on one side though, but the decent weather in Spain means that this is not usually a problem. 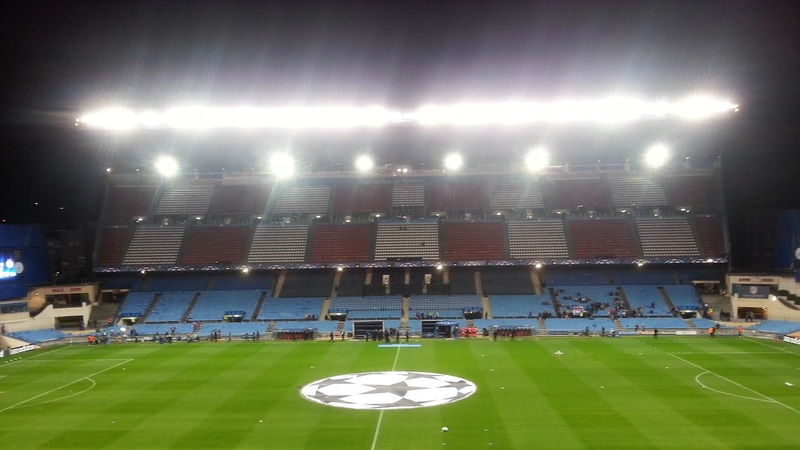 The ground looks very nice under floodlights too and most seats have a very good view. Club shops are in the form of various stalls around the ground, I got an unofficial match scarf for €10. There is a smart bar with lots of memorabilia on display and TVs showing live football. The catering is very basic in the ground and I didn't see any hot food, only snacks. It's not really a problem as the city of Madrid is a short walk away and has a huge range of places.